This long strip of parkland running alongside the Thames with views over the river towards Putney gets its name from the former resident of Fulham Palace which lies within the park. Traditionally the summer home of the Bishops of London, Fulham Palace which lies within Bishops Park is certainly worth a visit. The lawn area in front of the old house which includes a 500 year old evergreen oak is particularly attractive and a very popular spot with families on a summer's day. Just beyond is a delightful walled garden with orchard and ancient though slightly dilapidated herb garden. The park also has another famous resident; Craven Cottage - home of Fulham Football Club. Every match day the park and surrounding streets get clogged with football fans. The sports action doesn't stop there, you can also go bowling or choose one of the 15 tennis courts in the park - the largest concentration of courts in the borough. For residents, it's worth becoming a member (for a small fee) as they quickly get booked up in summer. There's also a paddling pool near to the cafe, referred to as Margate Sands - before the Second World War it was the closest many children got to a seaside holiday. 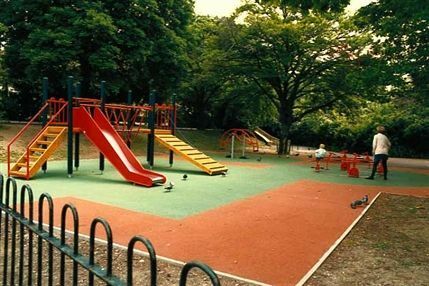 Bishops Park gyms, sporting activities, health & beauty and fitness. What are the best dining options near Bishops Park London? The best pubs near London Bishops Park. Bishops Park clubs, bars, cabaret nights, casinos and interesting nightlife. Where to have your meeting, conference, exhibition, private dining or training course near Bishops Park. From cheap budget places to stay to luxury 5 star hotels see our special offers for Bishops Park hotels, including The Lodge Hotel from 0% off.